If you grew up the way I did, you just didn’t waste food. A culinary trend that’s super hot right now when it comes to vegetables is to use as much of the plant as possible. This trend makes total sense. Gardening is also hard work so you don’t want your hard work ending up in the compost bin. We eagerly anticipate the first radish from our garden each spring. In fact, there could be more photos of first spring radishes on my husband’s Facebook page than photos of our grandkids! 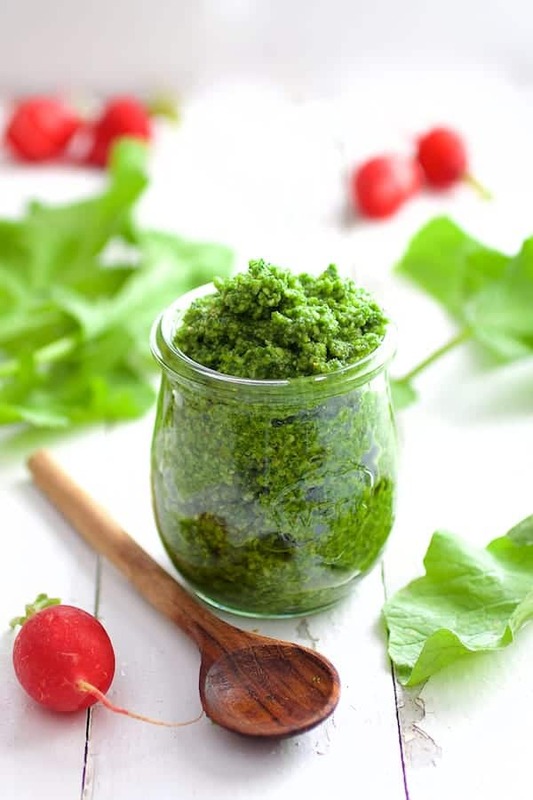 I had heard about making pesto with radish greens and at first, I wasn’t too hip about the idea. After making and trying it, I’m in pesto love and plan to freeze a batch each year just as we do basil pesto. Radish greens are completely edible. Because of their coarse texture, they don’t work well in salads unless they’re young and very small. 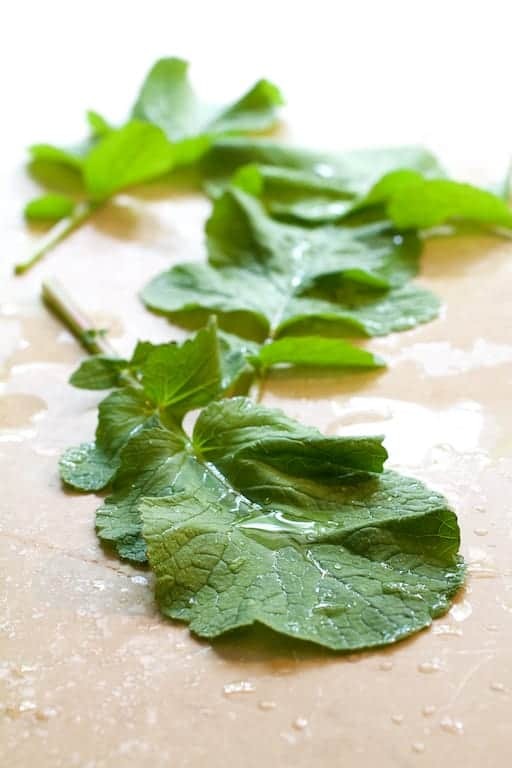 They can be cooked like any other green, but there too, you’ll want to use young and tender leaves. The texture of the leaves is why they’re perfect as a pesto. After they’ve been processed into pesto, you won’t notice the texture at all. Here’s another reason to save those radish greens. According to Livestrong.com, radish greens are a nutritional powerhouse, ranking right up there with broccoli and kale in terms of antioxidants. They’re also high in vitamin C and calcium. Wow! Radish greens can be muddy. To thoroughly wash them, fill a sink full of cool water. Place the greens in the sink and gently move them around so the dirt detaches. Remove the leaves, drain and rinse the sink, fill the sink again and repeat the process. I do this several times until I’m confident no dirt remains. Radish greens wilt quickly when separated from the root, so placing them in cool water like this also helps to perk them up. When you’re confident they’re nice and clean, spin dry in a salad spinner. (We like Oxo!) After that, pack the leaves into a food processor and you’re ready to roll! I own both KitchenAid and Cuisinart food processors and both have served me well. I like my KitchenAid because it’s light and I don’t struggle with lifting it from where it is stored in my kitchen. I use a Cuisinart in my personal chef business. It’s heavy but it’s also heavy-duty and comes with numerous sized bowls. You won’t go wrong with either one! This pesto has many of the same ingredients as a traditional basil pesto: Freshly grated Parmesan cheese, garlic, olive oil and nuts. Because of their pungent, peppery flavor, I suggest using mild, sweet nuts such as almonds, macadamia or pistachios. If you are allergic to nuts, use sunflower seeds instead. A little bit of lemon juice in the pesto really punches up the flavor. 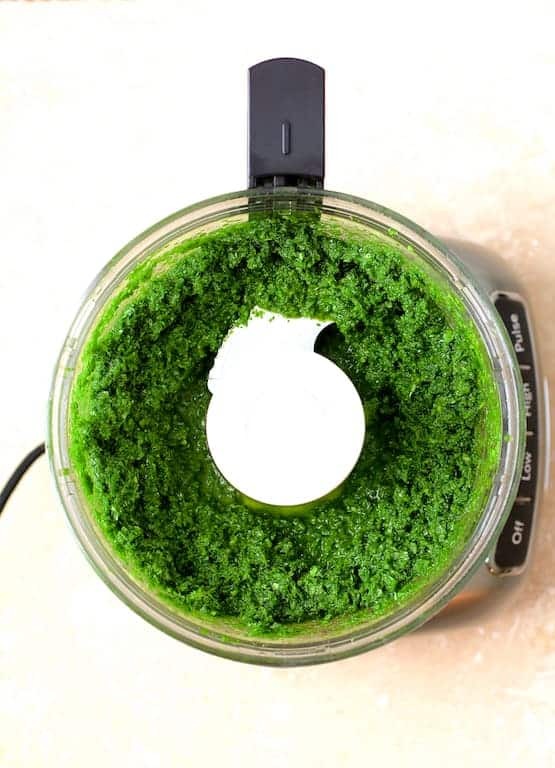 If you plan to freeze the pesto, leave out the cheese and the garlic and add it when you’re ready to serve it. Serve with fish, chicken, pasta, potatoes and any other way you would serve traditional pesto. Enjoy! 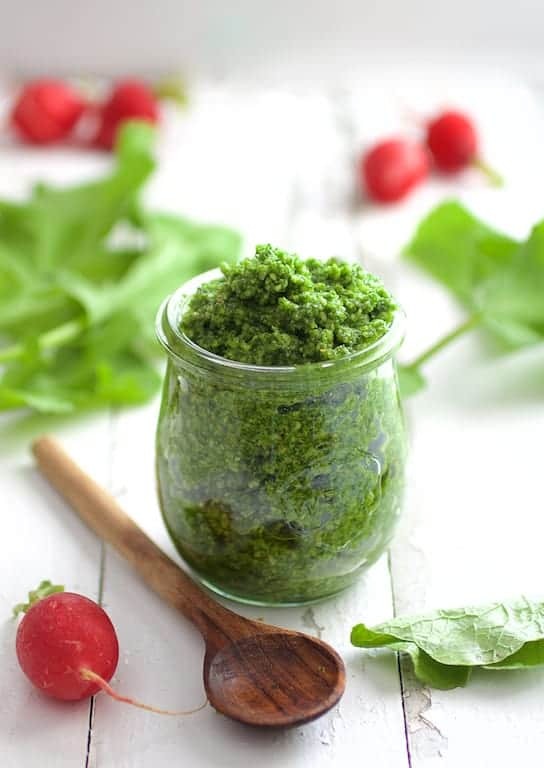 Pungent, peppery radish greens make perfect pesto and pack a nutritional punch! 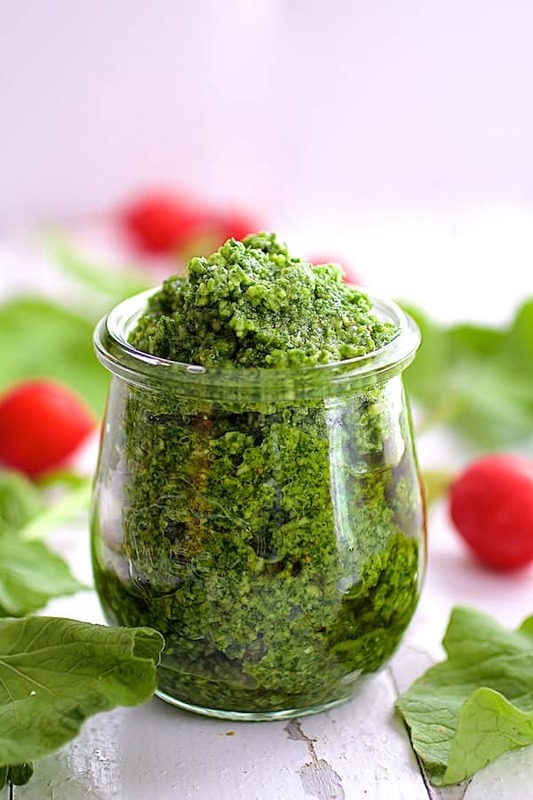 Use with chicken, fish, pasta, vegetables, potatoes or any other way you would use traditional basil pesto. If planning to freeze, leave out the cheese and garlic and add when ready to serve. Wow! Such a lovely pesto. I tried it with all radish greens and with half spinach. It is so tasty. My husband and son loved the first one – so much. My husband said he might even like it better than basil pesto! High praise indeed. Thanks for the wonderful, waste-saving, delicious recipe! Hi, Connie! Thanks so much! After I made it the first time, I also thought it was better than basil pesto! So glad you all enjoyed and please stay in touch! Recipe looks great! How long will it keep jarred and refrigerated? Hi, Maureen, Thanks for your question. I would only give it two or three days as the radish flavor starts to fade. Thanks again and hope you enjoy! Has anyone tried this dairy free with nutritional yeast instead of parm? 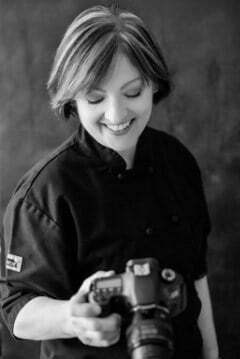 Hi, Alane, Thanks for your question. I don’t know of anyone right now but I’m sure it would work fine if that’s what you use regularly to achieve a “cheesy” taste. Perhaps try it without the yeast first. If you like it, then no need to add the yeast. Hope you’ll give it a try and let me know how it goes. Thanks again! Wow! I love the Internet! Was just cleaning a beautiful bunch of radishes & wondered: what could I make with these radish leaves? I used half almonds & half walnuts. It’s delicious! I love the idea of serving it with steamed spuds. Thanks for this great recipe! Thanks, Taza! I know…. radish greens! Who knew! 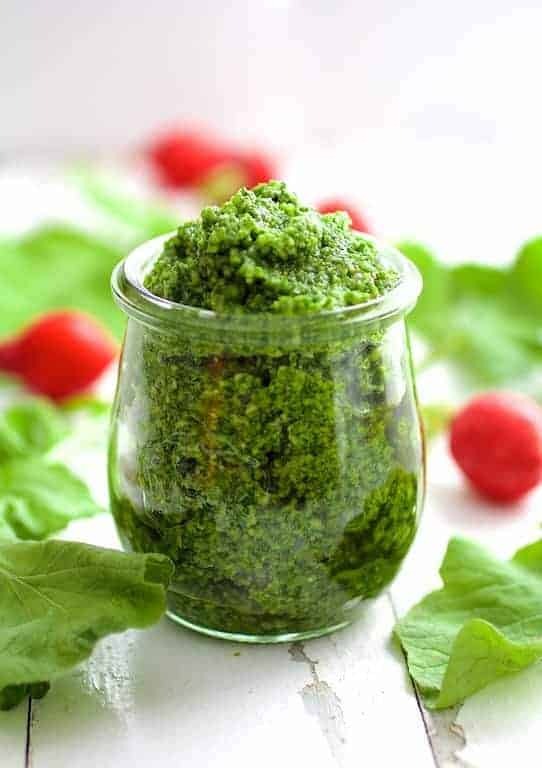 I think I like radish greens pesto better than basil pesto. It stays green! Thanks again and glad you enjoyed! Hi, Alison, Thanks for your question. Definitely remove them if they’re tough or woody. If you think they’ll blend into the pesto, then I wouldn’t bother. This recipe is all about using up things that people normally toss so you want to use as much as possible. Thanks again and hope you enjoy! I just made this– yum!! I added a bit more parm and garlic to mine. Thanks for the idea for using up those radish leaves, they won’t go to waste in this household anymore! I plan to use this over sauteed zucchini, zoodles, sauteed radishes, and maybe even those “miracle noodles”(we’re eating keto hence the low carb/high fat combos). Thanks again!! Hi, Sharayah, Thanks so much! By all means… one should tweak things to their taste! So glad you enjoyed and please stay in touch! Just made this and love it! Made a pesto and tomato pizza that was lovely. Carol, this looks so good. Last week I made a carrot top pesto and can’t wait to try this. I shared this recipe on the member page for my co-op farm. We get lots of radishes in our share and I’m sure this recipe will be very popular. Thanks, Eileen! We really enjoyed the pesto. I LOVE that it doesn’t turn black like basil pesto. It stays a bright vivid green and I did not know until I did this posting how nutritious radish greens are. Even my granddaughter loved it and she’s not into green food!